Here are the events that we plan to participate in during the remainder of 2018 (event participation is subject to change due to availability of volunteers). Please like and follow Acadiana Humane Society on Facebook for the most recent updates on events, new animal intakes, and newly adopted pets. Please click the links below to find our Facebook event pages for each event and click interested to keep up with the latest news! 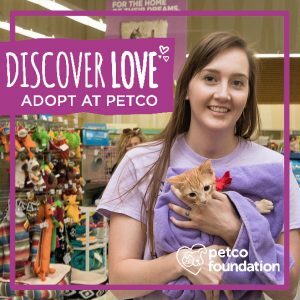 Saturday & Sunday, August 4th & 5th 9 AM to 7 PM: Petco National Adoption Weekend at both Lafayette Petco stores: Petco South at 605 Settler’s Trace Blvd. 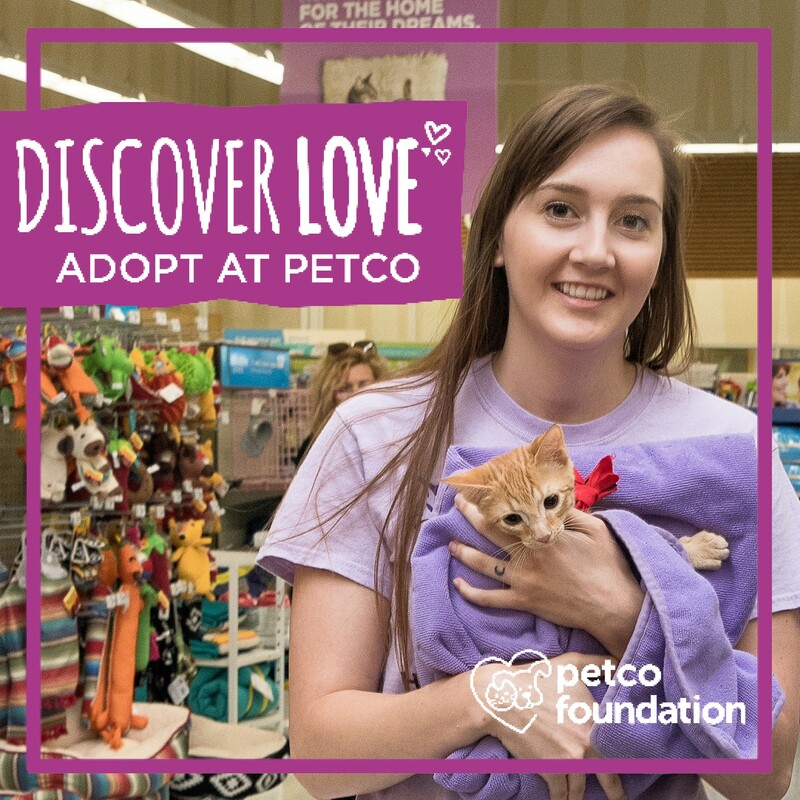 and also at Petco North at 3215 Louisiana Ave.
Saturday & Sunday, September 1st & 2nd 9 AM to 7 PM: Petco All For Saving Lives National Adoption Weekend at both Lafayette Petco stores: Petco South at 605 Settler’s Trace Blvd. and also at Petco North at 3215 Louisiana Ave.
Did you know you can double your donation to Acadiana Humane Society TODAY on SOLA Giving Day? 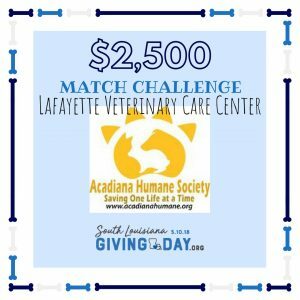 Donate now, May 10th to our no-kill, non-profit animal rescue through the following link, and Lafayette Veterinary Care Center will double your donation up to $2,500.00! Help us raise over $5,000.00 to help save and improve the lives of #animals, and the people that love them, in our community! We provide many services to Acadiana and surrounding areas: We rescue dogs, cats, rabbits, small exotic pets, birds, and even farm animals. We provide proper veterinary care and rehabilitation before these animals are made available to the public for adoption. We have a Pet Food Bank to provide pet food and supplies to those that have fallen on hard times, so that they can keep their pets. We also have a Spay Neuter Program for low income families and individuals to help them spay their cat, dog, or rabbit. We provide educational opportunities for local children’s clubs and schools when we have the opportunity. Please donate if you can! Your gift will go twice as far today! Thank you! 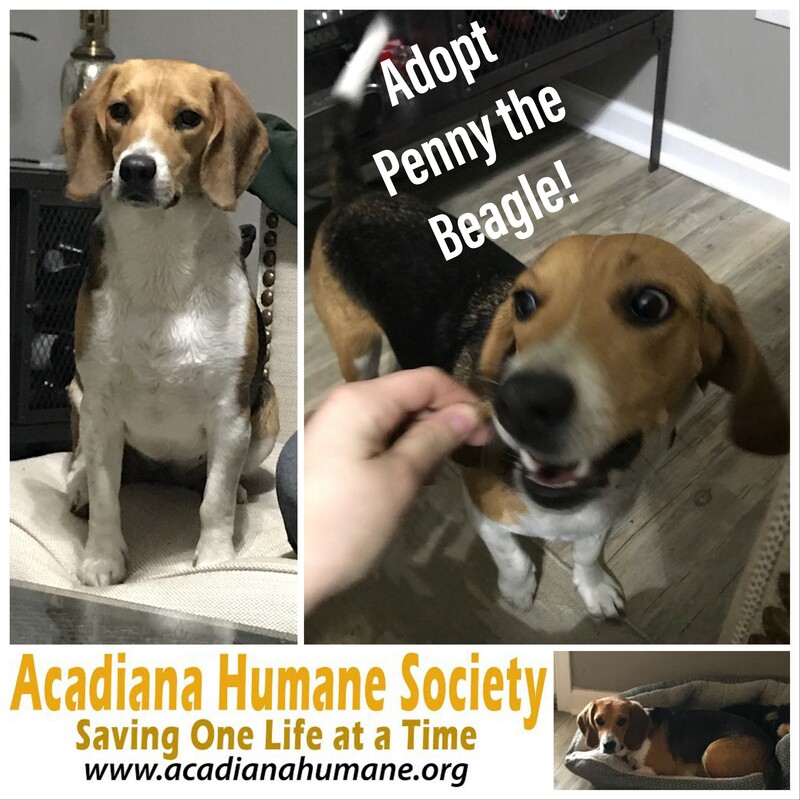 Our featured adoptable pet today is Penny. Penelope, also known as Penny, is one year old. She is a sweet purebred Beagle. Penny gets along well with the dog and cat in her foster home. She is a playful pup. She enjoys going to the dog park, and going for runs on her leash. She really likes being outside in general. If you let her, she will snuggle on the bed or couch with you. She isn’t housebroken yet (her foster mom is working on that), but she is crate trained. Penny is spayed, heartworm negative and on the ProHart Injection, up to date on vaccinations, and microchipped. She is available for adoption through Acadiana Humane Society. Need Cat Litter & more! 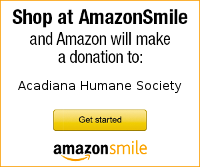 Acadiana Humane Society needs your help please! 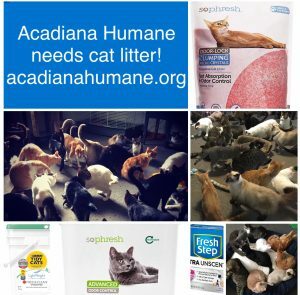 Acadiana Humane Society is in urgent need of cat litter! We can accept donations of any cat litter at one of our drop off locations. As well as money donated through PayPal that we can use to purchase cat litter. Gift cards and checks can be mailed to us. PayPal donation button is on the side of this webpage. Donations can also be marked AHS and placed in the donation bins at either Lafayette Petco, or at the Bridge Storage on Ambassador Caffery. You can also email us at ahspets@gmail.com or text 337-371-5477, to make other arrangements if you prefer. 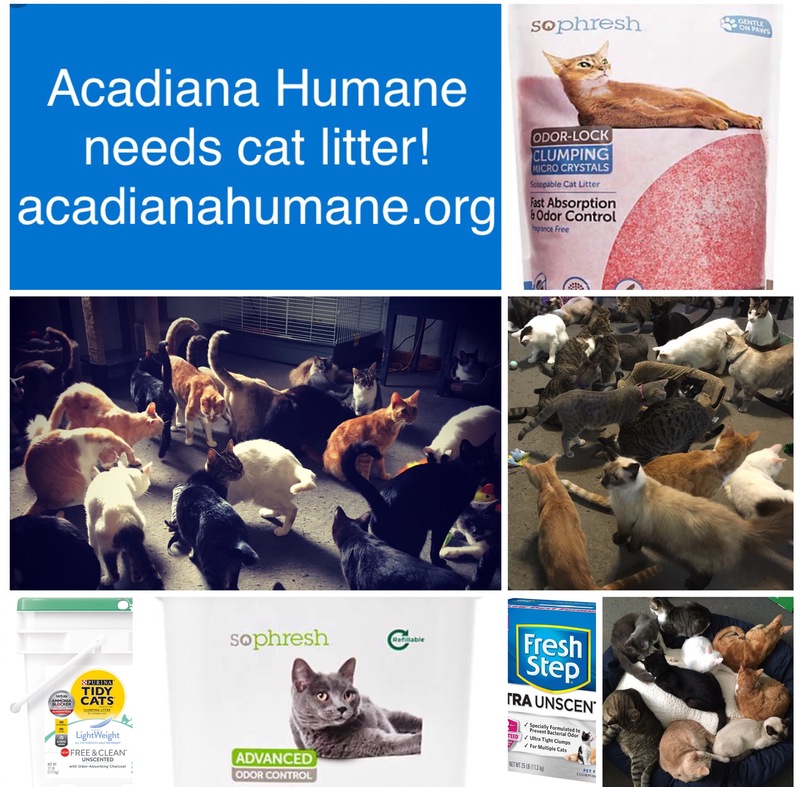 Any and all help is appreciated as we go through over 100 lbs of clumping cat litter per week, even more when we only have clay litter! Thank you! We also need other supplies as well, but cat litter and vet bills being paid are are two largest needs at this time. If anyone wants to donate other items, we always need cat food, kitten food, dog food, rabbit pellets, fresh or frozen produce, small animal paper bedding, flea prevention, cleaning supplies, business envelopes, printer paper, and basic office and shelter supplies. If you leave any items at any of our drop off locations, please mark them AHS to be sure they know it is for our rescue as they also accept donations for other non-profits. We are also in need of donations to help us pay off our current vet bills so we can continue to provide the proper vet care to all of our rescued animals. We still owe money to four different veterinary offices. You can either donate to us and we will pay the vet bills, or you can also donate directly to one of our veterinarians. When making a payment directly to one of our vets, please be sure to tell them to apply your payment to the account of Acadiana Humanw Society. Thank you! 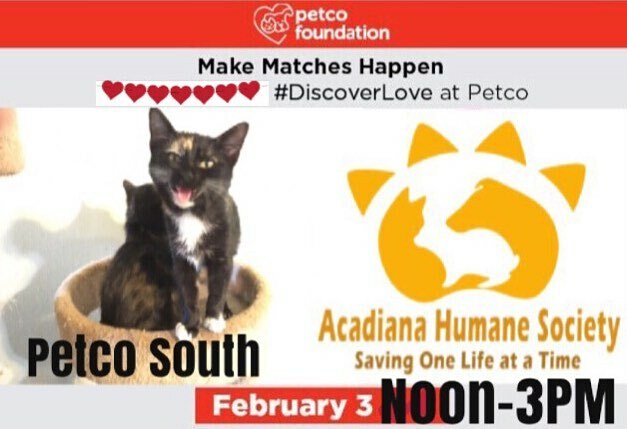 Acadiana Humane Society volunteers will be at Petco South Lafayette from Noon to 3 pm on February 3rd with adoptable animals. This is both an adoption event and a fundraiser. Celebrate love with us by finding love thru adoption, or sharing love by donating. There will be treats available for humans and pets! We will be accepting pet food & supplies, as well as cash, checks, gift cards, and credit/debit card donations at our table. If you would like to adopt, we recommend downloading our prescreening application ahead of time and submitting it via email so we can get you preapproved before the event! We have adoptable cats, kittens, dogs, rabbits, potbelly pigs, a ferret, and a bearded dragon! While we can not bring every animal to our adoption event, if you submit an application at least two business days before the event along with a request to bring a particular pet with us, then we will do our best to have that pet there if it is possible. 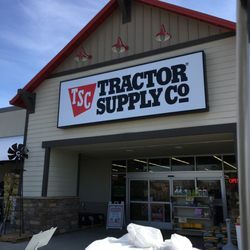 Petco South is located at 609 Settler’s Trace Blvd in Lafayette, Louisiana.